I love cricket. It is one of my favourite sports to watch and to play. I love the logic and the tactics behind it, as well as the skill involved. The cricket world cup is on at the moment, 14 of the worlds best cricket teams are competing in Australia and New Zealand. Of course I am wanting England to win but feel it highly unlikely at the moment, my money is on either Australia or India. With the challenge of the World cup well under way, I was set my own challenge by Betfair. I was challenged to create a recipe inspired by one of the teams taking part in the world cup. I have to admit this challenge had me a little stumped. First I had to pick a team, do I go with England who I would love to win, Australia or India who I think will win or someone else. I had a couple of ideas but I knew I had to include a few things. First I wanted a food item to represent stumps, a second to represent a bat and third I wanted to include pomegranates. Now the pomegranate thing might seem strange, and I shall apologies in advance if this should offend anyone, but I could not not include the reference. A term occasionally used by some Australia and New Zealand for a British person is Pommy. I have heard its use in cricket matches as affectionate abuse, a way if you like to wind up the England team before a match. More often than not it is light hearted banter but the fact the world cup is taking place in Australia and New Zealand and my will for the England team to win meant I had to include it. I began therefore by looking at where the pomegranate originates, Iran. Doesn't help me as they are not in the world cup. I then started thinking of ideas of things to do with the pomegranate, food wise. I decided to make a marinade and perhaps cook some chicken in it. I made a marinade using 1/2 pint pomegranate juice to 1/2 cup sugar. I poured the mixture over the chicken and it smelled amazing. The sauce was a sweet shiny red colour, and it reminded me of the shiny red of the new cricket ball. The marinade reminded me of Caribbean chicken, and that is when I picked my team West Indies. I checked to see if pomegranate had a connection to Caribbean and was pleased it did. I then set about choosing my ingredients to represent a bat and stumps. I decided that corn and sweet potato would work well and they both have a Caribbean inspired flavour to them, I had a Howzat moment. 2. Peel sweet potatoes, and cut into stumps. 3. 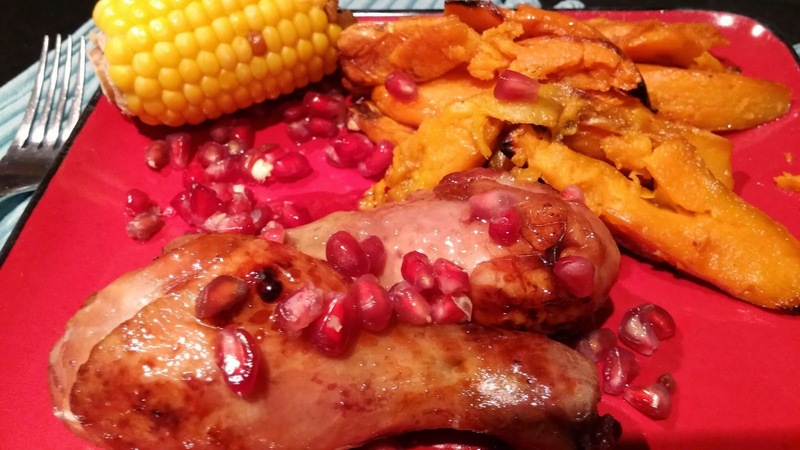 Mix Pomegranate juice and sugar together to make a marinade. 4. Place chicken in a roasting tin and pour over marinade. 5. Par boil the sweet potato stumps and then place in a separate roasting tin, drizzle with oil. 6. Put the chicken into the oven for 10 minutes, then place the sweet potato into the oven. Cook both for 25 minutes or until juices run clear on chicken and sweet potatoes are cooked through. This is a real fast bowler, with a lovely sweet curve ball thrown in that both adults and kids enjoy.